Fiddlehead Ferns (aka crosier ferns, ostrich ferns) are the scroll-like fronds of wild edible ferns. They grow in clusters near streams on mountain slopes in the NW & NE coasts of North America and have a flavor evoking both asparagus and artichokes. Fiddleheads can vary in size quite a bit, but we estimate that there are approximately 100-150 per pound. Store fiddleheads in a plastic bag in your refrigerator or blanch and freeze for long term storage. Up to two days fresh, several months frozen. 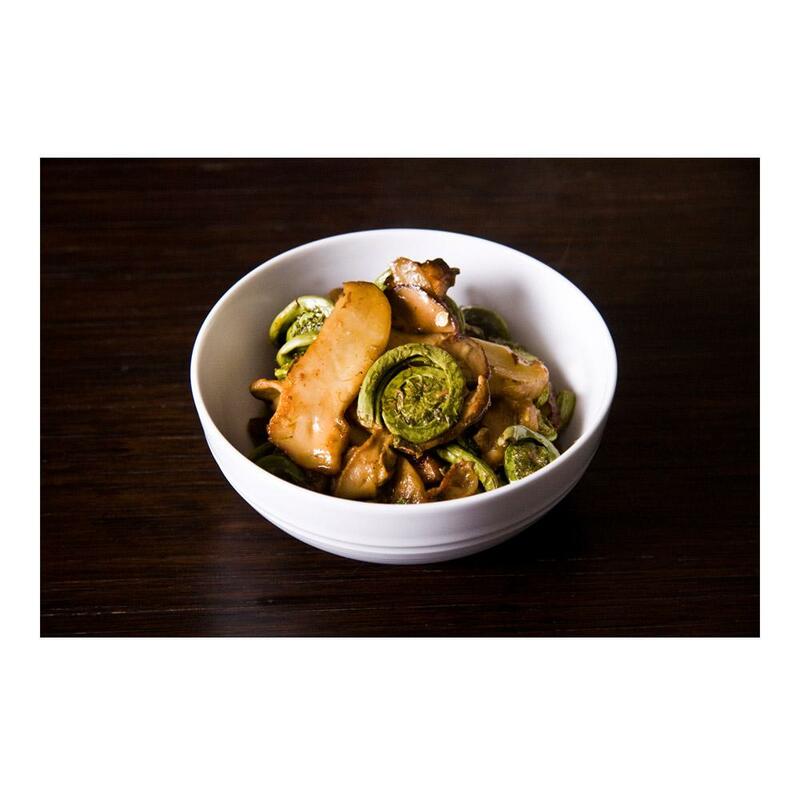 Whether they’re served hot or cold, fiddleheads need to be cooked before consumption. Before cooking, rub off any brown scales and trim to about 1 inch below the coil of the head. Discard any fiddlehead ferns with black scales, slightly purple fiddleheads are safe to eat. To prepare fiddleheads for cold dishes (like salads), quick cooking dishes where they may not cook through, or freezing, blanch them. 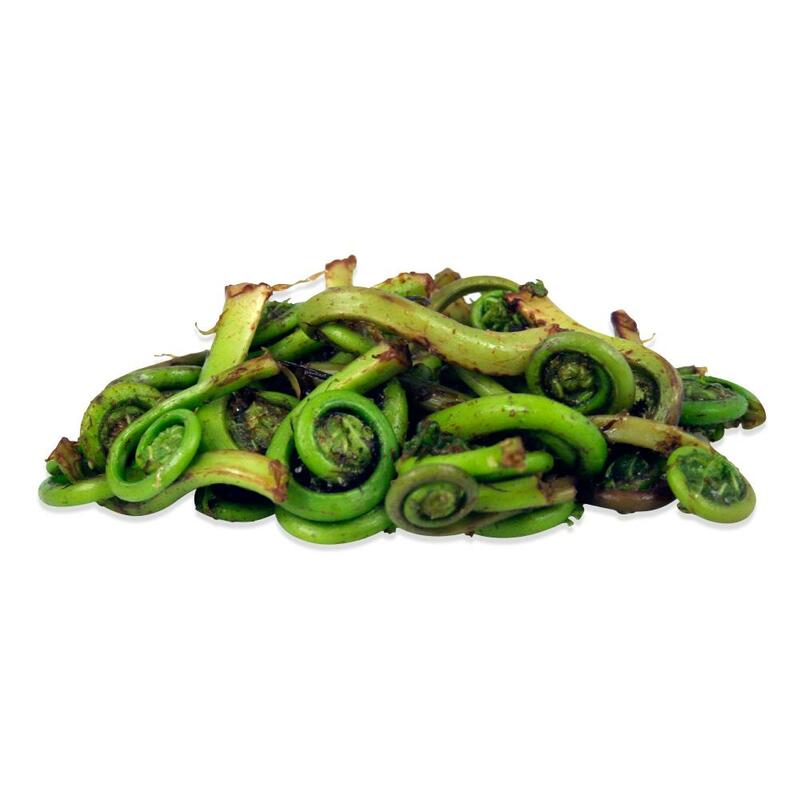 For use in hot dishes, fiddle head ferns can be sautéed, stir-fried, deep fried, or steamed. They should be cooked until they reach an asparagus-like texture with a light crunch that gives when bitten into. Fiddlehead ferns pair well with ingredients like mushrooms (especially wild morel mushrooms), freshly grated nutmeg, bacon, onions/shallots/leeks, salmon, lemon and potatoes. For a quick and easy dipping sauce, stir some freshly squeezed lemon juice into mayonnaise.